USI WrapSure thermal (hot) laminating pouches are designed for everyday applications. They bond well to copy, inkjet and other porous papers with light to medium ink coverage and provide a high-quality, durable finish. 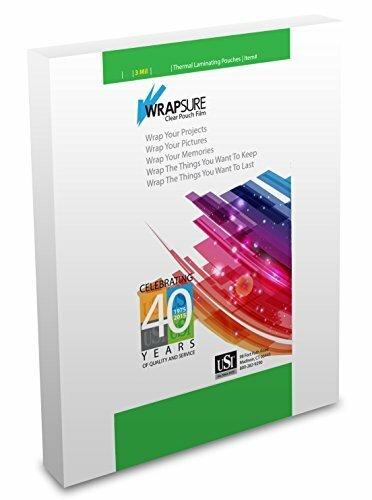 WrapSure is an excellent universal pouch film that can be used for your laminating projects. ULTRA-CLEAR, GLOSS FINISH: Exceptional clarity. Easy to use. EXCELLENT ADHESION: Adheres to copy and bond papers with light to medium ink coverage. MANY USES: Protect menus, documents, certificates, awards, papers, maps, signs, bookmarks, calendars, point-of-purchase displays and more. ROUNDED CORNERS FOR SAFETY: Shipped with 2 laminating carriers to avoid adhesive build-up on your laminator. Best-selling WrapSure laminating pouches. FROM USI...the lamination leader since 1975! If you have any questions about this product by WrapSure, contact us by completing and submitting the form below. If you are looking for a specif part number, please include it with your message.